FROM THE EDITOR: Sixteen years ago, we began publishing Religion in the News. Forty issues later, we’re ringing down the curtain. This is partly the result of financial exigency, but there’s more to it than that. It was a different world of religion reporting in 1998. Newspapers, shedding circulation but still making money hand over fist, had decided that religion was Important. Didn’t more Americans go to church than attend sporting events? Weren’t religious groups playing a big and unexpected role in politics? And hadn’t a lot of folks been convinced that we journalists were hostile to God and traditional values? We needed to let readers know that we felt their faith. Across the land, “Faith and Values” sections sprang up like mushrooms, with lots of space for stories and ambitious young reporters who were nothing like the mousy guy in the corner who used to process congregational press releases into briefs for the Saturday page. No self-respecting daily of any size wanted to be caught overlooking the religion beat. And big philanthropy took an interest. The Pew Charitable Trusts, whose interest in religion had centered on conservative faith communities, decided to get into the religion-and-public-life game, with special attention to “the media piece.” The Lilly Endowment, too, wanted a piece of the action. Trinity College’s new Center for the Study of Religion in Public Life, headed by a former newspaperman, was perfectly positioned to lend a hand. We proposed a magazine to help journalists make better sense of the religion stories they were covering, and Religion in the News was born. Our first cover story, by David Hackett of the University of Florida, looked at Promise Keepers, the evangelical men’s movement that seemed to be taking America by storm. The problem with the coverage, Hackett wrote, was that it was overly concerned with politics when the movement was really more in the longstanding evangelical tradition of seeking to persuade wayward males to shoulder their domestic duties. Providing insights like that was our ambition, and to the extent we could manage it, our stock in trade. This golden age of religion reporting wasn’t perfect, journalistically speaking. The Faith and Values sections bore a family resemblance to the Sunday auto sections—products more about appreciating than scrutinizing the object of attention. There was also a sense in the industry that religion in America had become less about institutions and more about the spiritual things people did on their own—a misconception that led to a lot of stories about things reporters weren’t very good at writing about. Still, when the biggest religion story in the history of journalism came along, the newspapers were ready. After the Boston Globe began writing about the Archdiocese of Boston’s systematic cover-up of the abuse of minors by priests in January of 2002, it was off to the races. This was the institutional religion story par excellence, about the biggest, oldest, richest, and most powerful religious institution in human history. And it reached from every parish in the country all the way to St. Peter’s itself. It’s a story that continues to this day, of course, to the Catholic Church’s immense moral and material cost. But the intervening years have seen more by way of journalistic than ecclesiastical implosion. As newspapers downsized and downsized again, the Faith and Values sections disappeared. Before long, a full-time religion reporter became a luxury most papers could ill afford. There was less coverage of the things Religion in the News wrote about, and a lot fewer journalists to read what we wrote. Moreover, even as the Internet wreaked havoc on newspapers, it opened the doors to a mass of commentary by experts and would-be experts in all fields of human endeavor—articles and essays and blogs and tweets available with a few keystrokes. Kibbitzing religion in the news—an occupation that Religion in the News had once had more or less to itself—could now be encountered in many places, and in real time. That’s not to say that anybody is duplicating what Religion in the News does. We still have a corner on tracing the trajectory of an important religion story and assessing its significance—the “story of the story.” To be sure, nowadays that means taking account of the fact that much of what passes for coverage no longer comes from traditional news sources. So rather than giving up the ghost, we have taken it on-line. This fall, we developed a new Religion in the News website that will offer what we’ve always offered in something more like real time. Rather than prepare a complete hard copy issue and then put it up on the Web as we have always done, we expect to publish a new article every couple of weeks. Send an email to csrpl@trincoll.edu and we will let you know whenever one is published. 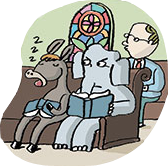 There will continue to be illustrations from Stephen Alcorn, the brilliant artist who, along with designer Jo Lynn Alcorn, has given Religion in the News its distinctive look since the very first issue. In addition, the site includes a regular feed of my Religion News Service blog, as well as a Twitter feed and featured articles and research from both the Greenberg Center and Trinity’s Institute for the Study of Secularism in Society and Culture. We’ll miss the old Religion in the News, and would like to think that you will too. There’s nothing like assembling an issue, putting it to bed, and having the tangible thing in hand. But we’re excited about the new venture, and believe that it will better serve a readership that now reaches well beyond the journalistic community, and which expects to see the world not from hard copy to hard copy but through a screen, brightly.